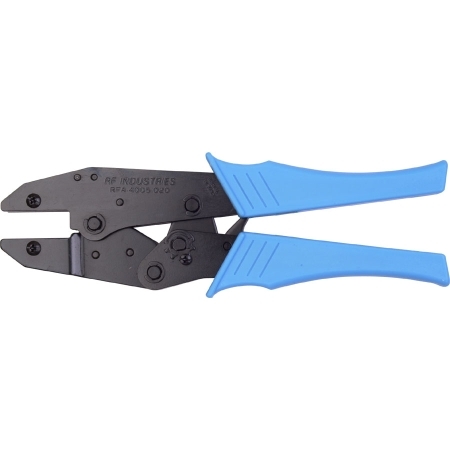 Universal cable crimp tool frame is compatible with RFA4005 and RFA4006 dies. This replacement crimp handle is ergonomically designed. The universal die frames are easily changed using either a Phillips or Standard screwdriver. Narrative The RFA-4005 and RFA-4006 crimp tools are precision manufactured of high-carbon, heat-treated, stamped steel and designed for smooth and rapid die closure. A simple pressure adjustment resets the scissors ratchet mechanism to compensate for different crimp dies and crimp forces. When the correct die is used, the full cycle ratchet will not release until a clean and tight crimp is achieved. Should a mismatch occur, the disengagement lever quickly releases the ratchet mechanism.